To keep up with all day expenses is a fair share of stress for the middle-class people. Though the cash supply keeps us ever-limited, the credit needs always remain high on demand. Piled up with expenses like EMIs to be paid, children education, home expenses and spending due to peers or societal pressures leave us empty pocket for no-short investment planning and savings. Never lose to file your taxes on time: Always get your taxes done before they prior to any penalty or default claim. Taxes wide up your finance sources and strengthens your investment plans. Get yourself a well-planned tax schedule and all the planning stuff outsourced to some agency online which as observed in normal course is much more cost saving than the available offline options. Define a saving target for yourself: Manage to have some savings stored in your family treasury after all necessary expenses. Keeping the leftover balance without any exception either weekly, monthly or yearly, this can build up a good financial support backup for the spending. Try to keep yourself away from peer spending if influenced by one or the other group or some social medium. Be tight-fisted for impulse purchasing: Shopping offers, credit cards left in pocket and peer pressure is a root cause of impulse purchasing. Be cautious and make a second thought before finalizing a purchase s, try to schedule your expenses to line them up either weekly or on a monthly basis. Think before big investment spending: Get yourself a spending guide or a financial planner, to guide you for each new investment avenue you get to invest before. Try to find the benefiting derivatives and past performance charts of the investment schemes like ULIPs, debenture investments etc. There are various professional organizations which help middle-class family groups to invest and get ownership benefits in new projects. Subscribe to such service providers and keep them indulged with your investment goals. Always look for alternative earning sources: If you say you do not get time to look for an alternative source, then it’s a myth. Try to look for small investment saving schemes, spare time earning sources and the sources which your tax planner guides you about. Keep credit cards only for emergencies: Try to use your debit card in normal course. Avoid usage of multiple credit cards for payment offers distracting you, try to save some out of your impulse purchasing habit. Always use digital payment options, whenever you make your needy purchases to get short savings in the form of cash back and future cash saving vouchers. Compare and buy yourself or for your family a decent insurance or cover plan: Compare and buy for yourself or for your family a decent insurance or a cover plan which either be a returning term plan, health medi-claim plan etc. With portioning a small amount for premiums for such plans you get saved of your major usual fund spending for medical treatment, health check-ups etc. Prioritize your spending: As stated above scheduled spending and saving without an exception always work. Another effort could be made by prioritizing the spending for each month .i.e. for a middle-class earner priority expenses comes of EMIs to be paid, bills to deposited, kids education expenses, grocery etc. All these expenses can be well planned within a limited income if a pre-planned schedule is followed and spending is done by segregating funds according to the priority of transactions. 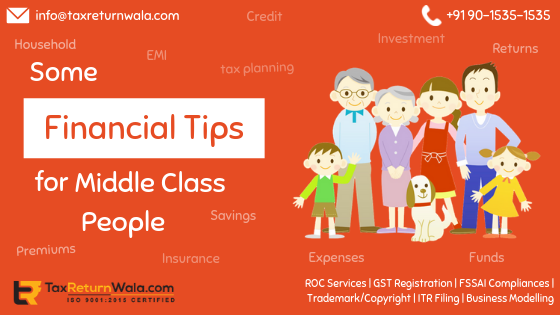 However, the middle-class group feels trapped to a cycle where they struggle to find more sources of income for their next month spending, the above tips can bring them a sigh of relief to their upcoming budget adding some more savings options.